5. can map any software based on Hiragana for any ~21 languages of India. This chart gives you the formula how almost all Indian languages [21?] can be mapped into Hiragana and additional features of Indian language can be accomodated without any special consonat/vowel creation. This means ALL softwares for Hiragana can easily be mapped for any Indian language. The salient characteristic is Hiragana has 39 consonants, 5 vowels, 2 symbols and thats exactly case for this hypothetical language-alphabet which I call Indou-gana. 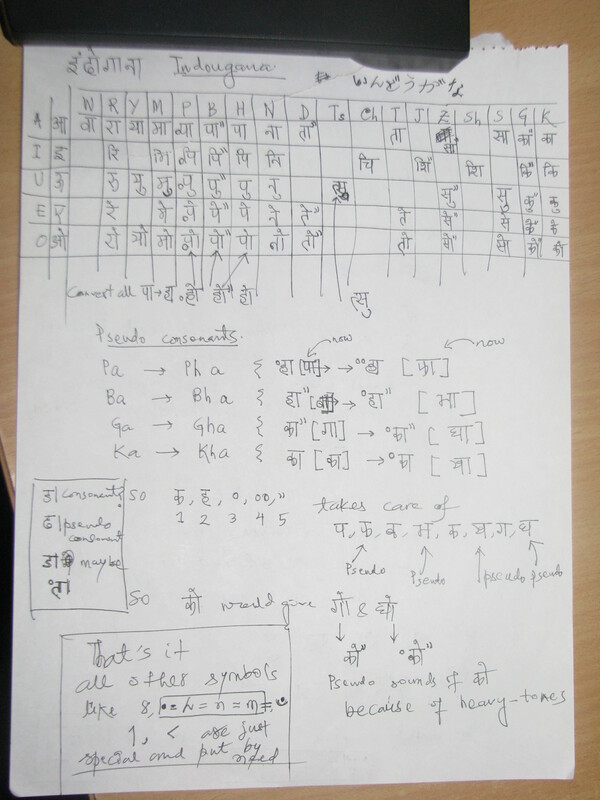 Indou-gana differs from actual Indian alphabet in the sense of a computer-proximal-pure-logic driven language as a multi-faceted computer and human language which interfaces any two languages as long as they have an intermediate Hiragana-Indougana module. Therefore any Mexican who knows how to interpret Japanese [or better any machine that does it] can also read indougana therefore any of the 21 Indian languages. That means a Japanese person ccan read/learn ANY Indian language. 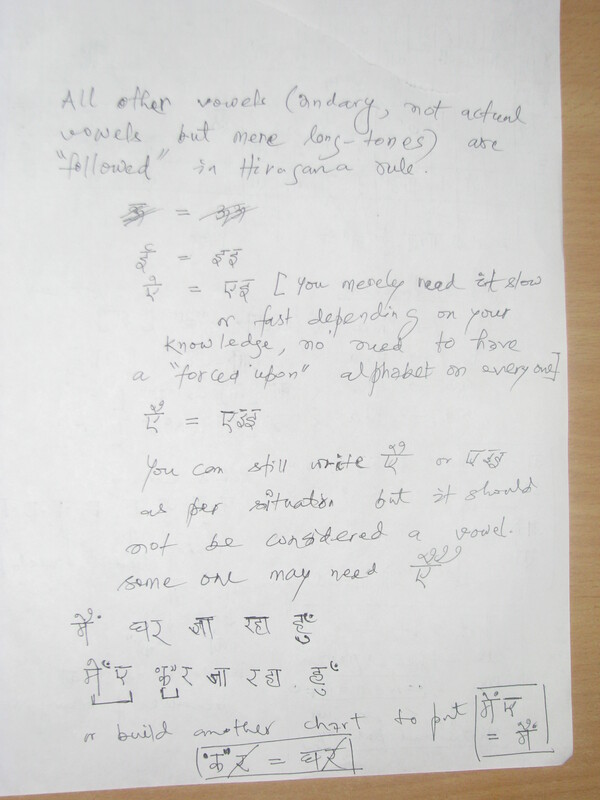 [one just need to map into his choice, this is easy since internally all Indian languages are very closely mapped] Also any Indian of any language of these 21, can without much difficulty learn Japanese and through that any other language tahts available. The previous difficulty was noone had ever formulated the Indian alphabet system well enough and there were eg 11 vowels, heavy-tones and long-tones though as vowels and so on. This is an innovation made in 30 minutes. Enjoy. 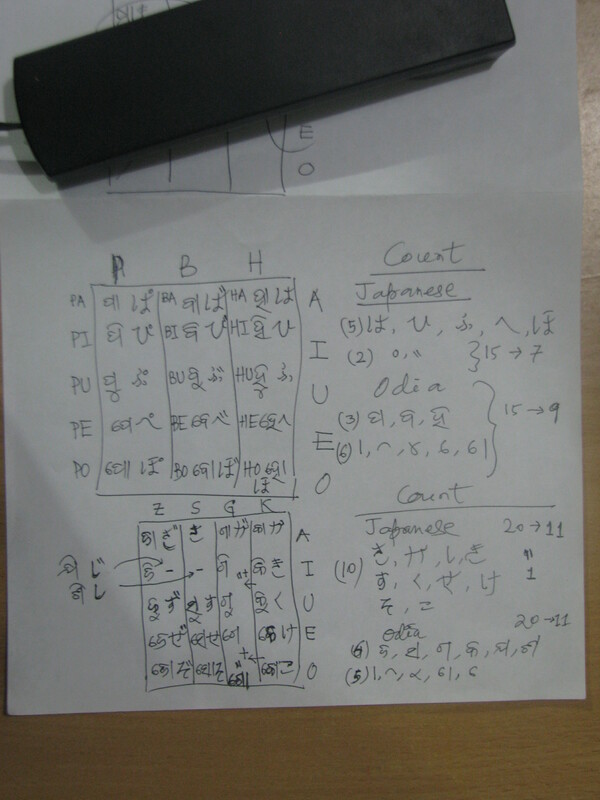 Just constructed a new alphabet called indou-gana, Indian alphabet in terms of hiragana. It has 39 consonants, 2 symbols, 5 vowels + 1 special sound n, and rest of the Indian matras/phalas can be added. The pseudo consonants of Indian alphabet [eg kha, gha, pha, bha etc] do not need additional symbol. The advantage of this is all the advance software written for Hiragana will immediately be mapped… for all 21 languages of India not just this language or that language. [One can merely put all words known in India in all language, map them to Indou-gana]. All the problems of pseudo consonants, pseudo vowels, diacritics, this, that, ancient sound, future sound, they are gone. This way Japanese people will instantly understand all Indian language [and can chose which they want to master fully] + anyone who knows Japanese, eg someone from Mexico will instantly know Hindi or say Bengali and Indians can learn Japanese pretty swift. Since a software can be very easily developed with multi-lingua interface one can simply hit enter and the word/spelling/pronunciation will show up. It depends how much manual work then is put into this to build robust automated system. I will scan the chart as taking picture isn’t looking very clear. ‹ Why is India poor? A mathematician’s view point.